If you are in the market for healthcare and beauty products, Kroger Delta has an amazing deal for ONE DAY ONLY! 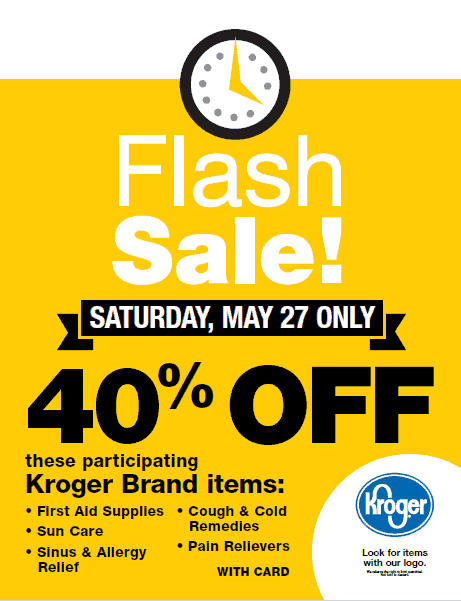 Get up to 40% off participating Kroger Brand health and beauty products. Stock up on all of your summer essentials because Kroger brand sunscreen and aloe vera pain relieving gel will be on sale! Need to build your home first aid kit? Get your supplies at your local Kroger. You’ll find isopropyl alcohol, hydrogen peroxide, and several types of bandages on sale, too, along with basic medications. This sale is only valid in the Kroger Delta region on May 27th, 2017! This is a sponsored conversation written by me on behalf of HBC. The opinions and text are all mine.